So I’ve been doing dissertation research (because apparently that’s just the rest of my life) and I’m currently reading all the way through a book that I’d only read sections of before. Peter Coogan‘s Superhero: The Secret Origin of a Genre. One of the things I’ve been struggling with in writing my dissertation was the exact definition of a superhero. I’m not alone here. This comes up in a bunch of academic texts. There’s a base inclination to just sort of say “I know it when I see it” the same way we do with art. But even with art that’s subjective. And in superheroes, it FEELS, like it should be more objective, but I’m not sure it is. Some of them are really obvious. No one doubts that Superman is a superhero. So are Spider-man, Batman, Wonder Woman and Captain America and Luke Cage. Other’s are less obvious and come under dispute among fans. Is the Punisher a superhero? He’s certainly the star of a comic books, but he breaks a lot of the conventions of… superherodom. He doesn’t have powers (but neither does Batman) he kills his opponents (but so do a lot of characters, especially in the modern movie age). But in a lot of ways he just doesn’t feel like a superhero… except for all the times he does. And then what do we do with even more edge cases. The farther we get from comic books, the more it sort of feels like superheroness is questionable. Is Buffy the Vampire Slayer a superhero? Is Luke Skywalker? Indiana Jones? John Cena? And yes, I’m serious on that last one. Anyway, Coogan makes an interesting argument that superheroes are specific to the superhero genre. They work within (and define) its generic conventions. According to Coogan, the superhero genre is defined by having a Mission, Identity and Powers (MPI) as his core building blocks (39). That’s not to say that all superheroes have all three or that characters that aren’t superheroes can’t have all three. It’s just that that is the beginning of the core archetype that we compare a character to decide if s/he is a superhero or not. The characters have a specific mission to improve the social good (for instance truth, justice, whatever), they have an identities that are emblematic of their status as a hero and they have abilities beyond the normal scale of other characters in their world that make them exceptional. In Coogan’s reckoning then, Buffy for instance is NOT a superhero, because her identity as Buffy Summers is irrelevant to the concept of what she does in a different way that say Luke Cage (who still only has one real identity) is identifiable with his status as a hero. Batman, while lacking super powers, per se, manages to still have “powers” in the narrative sense beyond what Commissioner Gordon for instance has. So the claim here, of which I am not sure I totally agree, but I certainly don’t entire disagree, is that superheroes only exist inside of superhero genre stories (this is not to say that a story can’t be multi-genre. They often are… Captain America: The Winter Soldier is both a superhero movie and a spy movie. But it is to say that Kingsman: The Secret Service is a spy movie but NOT a superhero movie and that Eggsy Unwin is not a superhero. In other words, Coogan argues that the supervillain does NOT require the superhero genre. Supervillains exist outside of the conventions. They are the powerful evil antagonist that is fought regardless of whether the heroic protagonist possesses superpowers or not. And this makes sense. He has a point. While supervillains often oppose superheroes, I think we tend to think of them more as just powerful adversaries, rather than as necessarily specific sets of traits that need to be built into the archetype. The Ghostbusters are certainly NOT superheroes in any reckoning… or at least I wouldn’t think so. But Zuul really does seem like a supervillain. And again, in Kingsman, Valentine certainly seems like a supervillain. So do a lot of Indiana Jones characters… So does Darth Vader… So does the current president of the United States. So that’s what I’m sort of thinking about right now. And because I like having other people help shape my ideas, I’m want to know what other people think. What makes a character into a superhero? What makes a character a supervillain? What makes something a superhero story? Can superheroes and supervillains exist outside of that genre or does their presence specifically set that as the genre (or vice versa). Can superheroes and villains exist without each other? And do you agree or disagree with any of the random examples I gave here (or have other interesting ones that complicate or clarify the questions I’m working through)? Thanks for the kind words, Chris. So…James Bond–superhero? I say yes, especially pre-Craig. Absolutely. I do love that book. So then you would say Eggsy is too. Since he’s basically millennial Roger Moore bond. For me I feel like both of them don’t quite hit the superhero line. I’m not as hard on the line as Coogan is because I agree with you on Buffy. I also don’t think of say… Beowulf or Gilgamesh as superheroes… but then, Chris Gavaler’s whole book (which I didn’t think to mention) is pretty much an argument for why they are. On the other hand, I feel like John Cena is, even though he certainly exists outside of the superhero genre. Nope. Super hero (hero who is super) but not superhero (protagonist of the superhero genre). James Bond can walk into a Superman story and not change things, but he moment Superman flies in, the Bond story warps. I actually have a similar distinction in mind… maybe less of a hard line. Bond feels like an exceptional human… ridiculous and unlikely though the stories may be… Bond, Indiana Jones, Eggsy Unwin, and even impossible science characters like Ghostbusters “feel” like they live in a non-superhero world. Batman, is still a human but he exists in a world that only works with superhero conventions. And to get really fuzzy, John Cena (the character, not the man who portrays him) feels like he essentially is a superhero as well. Here I’m sure Peter will differ… but Cena has sort of an essence that requires him to be mythically superpowered in order to work. You can’t train to be John Cena. You have to be a natural born hero… but then maybe he’s not a superhero… maybe he’s a mythic hero like Odysseus or Beowulf… unless you count them as the same thing the way Chris Gavaler does. A superhero is not one in his/her mind. They simply do what is right with the power or ability to back it up. so then doesn’t that leave it open for a lot of people? Not just people like superman… but even real life people like say cops or firefighters? What makes superheroes special? Well, it depends. You could say that the choice of profession: cop, fireman, doctor, soldier is because they want to serve the fellow man. But we know the motivation could be for other factors. Not unlike nature and nurture, getting the power or ability to be or do something extraordinary can make a person either be good or be bad. But what about the anti-hero? Which is why I go back to the premise that a superhero is not one in their mind. They just to what is right. Ok… so you’re defining it “within the universe” sort of. So like if you asked Lois Lane what makes Superman a superhero, that’a what she would say. As opposed to like looking at it from outside of the universe as a writer or reader where you could talk about specific things like storylines and tropes that don’t make sense if it was real. So Superman is irrelevant to superheroes? Because that’s what you are saying. The superhero genre is a genre. Also Ricky, what you are saying is super (powers) and mission (hero), but the genre is more than that. I respectfully disagree. First a hero doesn’t need powers to be a hero. Think Sully the pilot who landed on the Hudson. And he doesn’t consider himself a hero, he just did his job as trained. Next: if the argument is made that some one is born good as many write Superman, then why really need Pa and Ma? To reinforce what was already there? You could argue that for some being good and doing good deeds is in their nature, that’s fair however, the genre of superheroes IMHO is not unlike putting ordinary people in extraordinary situations and them rising to the occasion but at times suffering or facing great personal sacrifice because if they don’t struggle they become complacent or arrogant. The genre of superheroes is myth making. Stories of deeds and people more extraordinary than ordinary. Are some ‘born’ good? You could argue it is in their nature but without struggle there are no heroic acts to gauge against. Superman’s struggle has always been his control, to not be self serving, tyrannical and arrogant. That makes him relatable. I got lost on Buffy is not a superhero. Mission: monitor hellmouth, kill vamps. Identity: vampire Slayer(maybe a stretch but the identity is a thing of its own). Abilities: present. Coogan argues that Buffy’s position as “slayer” is a job, rather than an identity. He goes into a lot and i’m not going to copy the whole chapter. The easiest way of thinking of it is probably to think about the costume and the codename (though neither are required). Superman’s JOB is superhero or justice league member. But his identity is Superman. The costume, powers, name… they all go together to formulate the identity that is Superman. And when you say Superman you mean an individual and not a function. Same with Batman or Spider-man or Wonder Woman. When you say Slayer, you mean Buffy or Faith or Kendra or any of the potentials. There’s not a fundamental thing that makes the slayer coincident with the identity. And Being Buffy specifically isn’t part of her superheroness the same way being Superman is to Clark Kent’s. The concept and the name are separate whereas for the superhero the concept and the name combine to be the identity. Xander would never say “I’m talking to Slayer” and the vampires aren’t afraid of the concept of Buffy. anyway, his book would argue that it’s not so much specific definable tropes like Coogan says but more nebulous stylistic ones. So Buffy has a heroic origin, she develops unwanted powers, is reluctantly called to adventure that she cannot abandon, goes on a episodic adventures coincident with her own character development…stuff like that. It’s much more inclusive and that’s why i expect he also includes Bond. Would POTUS be a job or an identity? Chris Maverick You pretty much got it right. My background as someone who creates superheroes and stories about them informs my view in perhaps a more marketplace oriented manner than Peter’s. Mark: I expect POTUS would be both a job and an identity under Peter Coogan’s taxonomy…. but since the president lacks the power portion of the equation he wouldn’t count, even though he arguably fits the mission portion. Someone at Webster University (where my wife teaches and where I have taught) posted the PDF page proofs. So that’s available. Chris Maverick Also Buffy is very genre limited. When she goes on patrol, it’s to fight vampires, not to help people in trouble generally. She doesn’t have the universal mission of the superhero. Hmm…. see, I don’t know that Buffy is just patrolling for vampires. I think it’s more that in her world most crime that she happens to encounter is supernatural based. But in the same way that this the case for Blade. When she happens to encounter a cyborg (Adam), mad scientist (Warren) or just a disgruntled school shooter (Jonathan) she fights them too. To take your example of moving the character from genre to genre and checking for disruption, I’d argue Buffy is disruptive if inserted into Bond’s world in the same way that Superman is. I consider superheroes to be just a modern version of the mythic hero and I think there is a clear line of succession (possibly with some gaps during the less literary ages) of story genres that led up to the archetypal golden / silver / bronze age comic book superheroes (I’ll get back to this point in a bit). Odysseus is a superhero. So was Achilles. King Arthur was a superhero. So was Sherlock Holmes. The classic superhero has its roots in pulp fiction. Zorro and the Lone Ranger were the building blocks of the superhero genre. They were set in western settings for a reason. Western settings were the cultural equivalent of comic book settings when those characters were created (light, over the top, etc.). Capes and masks / helmets and symbols have existed on these heroes since the early days, but only truly seemed iconic as they became less common in modern society. Zorro looks less out of place in his time than he would in ours. The Phantom is arguably the reason that tights became a thing. The point of this stroll down history lane is that I personally don’t see any narrative difference between these older mythic heroes and the heroes that followed them. From ancient times to modern, the concept of a “larger than life” hero that stood up to clear evil is consistent. The comic book genre that helped define the term “superhero” simply had the advantage of colorful art to make it stand out that much more than its predecessors. Now, I will say that I have been careful with my wording here for a very good reason. I don’t think the modern superhero genre and the classic comic book genre and still part of the same genre. I think the majority associate them as the same, because most people don’t differentiate the medium of the storytelling from the genre when it comes to comic books. In simple parlance, to the average person, and even probably the average comic book fan, all comic books kinda look a bit alike. I don’t have the knowledge to break this down perfectly, but I suspect there are at least three distinct genres in what is classically lumped together in the superhero genre. I think gold and silver (and maybe bronze) ages form the actual “superhero” genre. This is where the world is colorful, heroes have the gift of perfectly knowing right from wrong, and identity as a superhero is a key component of the genre (thus the reason for so many dual identity stories). I think somewhere in my youth a second genre came fully into its own (though the seeds appeared decades earlier). For lack of a better term, I will call this the “powered hero” genre. These heroes live in a slightly less colorful world (though still pretty bright all things being equal) and care little about identity. Many are known by their real names or treat their alternate identity more as a uniform than as a disguise. Knowing right from wrong is not critical to this genre and thus you get heroes like Punisher. In my opinion, in Marvel, at least, this genre cemented its place with the Civil War storyline. Finally, I think we have entered a third genre in recent years, in great part due to the medium of movies. I don’t know that it has fully evolved yet, but I see signs of it both in movies and in the recent style of “superhero” comic books. Right now what I think stands out most about this genre is that characters basically all exist in a greater context. I mean this is obvious in the MCU, but it also stands out in comic books as well. Even when I was reading Spider-Man comics in the late 90s, early 00s, the vast majority of his stories were contained to his little neck of the woods (NYC) and team-ups were the exception, not the rule. More and more, he is paired with characters that didn’t originate in his book. The second thing that seems to be part of this genre is that characters seem to have a much stronger political sense of right and wrong than they used to have. Oh, I don’t want to say that earlier genres didn’t tackles politics, just that it seems to be at a more character driven level these days. All that text is to say that I think part of the reason it is so hard to define a “superhero” is because the word is badly overused at this point. A superhero is now an archetype that has existed in at least three (maybe more) distinct genres. And since we have failed to acknowledge they are different genres (impressive given the fact that we differentiate some aspects of comic books incredibly specifically), we end up comparing unlike things that have been given the same name. Based on that, I would argue that Punisher is a superhero and maybe even John Cena is (he seems to fall pretty well into this new genre that I can’t fully define yet). It’s not hard. It’s very easy. But I cover all this in my book. Three genres fed into the creation of the superhero genre: science fiction superman (Frankenstein to Doc Savage), dual-identity crime-fighting avenger-vigilante (Gray Champion/Nick of the Woods to the Shadow) and pulp ubermensch (Tarzan to Doc Savage and the Shadow). Michael Strauss True, i suppose. Though once I started looking into it, it became very clear, which is why I get so pissy. I don’t mean to be obnoxious (though I suppose I am). I actually could have this whole conversation myself because I’ve had it hundreds of times over the past 25 years. But I’m glad people are interested in the topic. Superman was created in tights before the Phantom. Superman inspired Batman, then the flood was released, so the Phantom isn’t important for the superhero genre. The Phantom is a pulp hero in a costume, but it’s not an iconic costume that expresses the character’s identity. If you saw him, you wouldn’t think “the phantom” but you might think “the skull” from his belt chevron. as for the conversation after that… there is a distinction between pulp hero and superhero that I think is maybe too nuanced for here… maybe not. I think Peter and I would both agree that, for instance the Shadow is not technically a superhero, he’s a pulp hero. Phantom I’d probably disagree with him on… I think he’s both a pulp hero AND a superhero (in the same way that… I dunno… Captain America is both a superhero and a soldier). But I think we’re getting into levels of academic distinction that I don’t know that Strauss cares about. Super villain has the word super in it and is probably best defined as a villain that is super. Great at being a villain. Superhero is more of a gestalt. It does not mean a hero that is super or simply a hero who has super powers. It has connotations beyond that. Lex Luther in the 1978 Superman is a great villain against Superman. But has no super powers. But he understands ways to get at Superman. Even if you wanted to limit supervillains to the genre of sh or cb movies I don’t think they would have to have super powers. Note superhero is more readily accepted as one word than supervillain. Always versus mostly. Super hero = hero who is super. Superhero = protagonist of the superhero genre. I lay out the supervillain as well. The only supervillain indigenous to the superhero genre is the inverted-superhero supervillain. All the rest (monster, enemy commander, mad scientist, crime lord) predate and live outside the superhero genre. And you literally say almost exactly that at the beginning of the last chapter I read which was when I thought that maybe i’d put together a blog post. I never addressed Jim Mercurio’s comment directly. You make an interesting distinction with the space vs. no space and how it relates to the characters as you envision them. So if I’m reading you correctly I’d say that you don’t see the villan and hero as super-opposites. That is the super means something different to you when attached to the protagonist/hero than the antagonist/villain. Correct? Kurt Busiek has a nice essay in What Is a Superhero? that expands definition from three elements to six ( superpowers, costume, code name, secret identity, heroic ongoing mission, and superhero milieu) and argues that a character needs only three of the six elements to be considered a superhero. This discussion is important because I need Buffy to be a superhero for my dissertation. Buffy is a super hero, not a superhero. And Whedon agrees with me (“I agree with you. You can’t dress up like Buffy.”) If you look closely at all the pro definitions in What Is a Superhero, they boil down to Mission, Powers, Identity, and typical but not necessary conventions. Busiek’s is powers, identity (codename, costume), mission, and milleu (generic distinction) and secret identity (typical but not necessary). John: Do you actually have a PDF of the Busiek essay. I *think* I’ve read it before…. if its the one I’m thinking of. But I don’t have it. I actually find it an interesting thing idea that he has a specific idea that there is a hard line of where you become a superhero in the number of requirements. Chris Maverick I have a bunch of copies of the book. Where do you live? I can mail you one or I can send you pdfs of the articles. It’s in What is a Superhero. I have all the What Is essays, but I may not have the final version because of the back and forth of the editing and because Robin Rosenberg did much more of the work than I did. Oh, Ok… i totally have that as a kindle book… just not the PDF version. I knew I had read it before. The world is a lot harder when you can’t just look at a shelf. Chris, superheroes can exist outside the superhero genre. Captain America (superhero) can appear in a Nick Fury (spy) story. Captain Freedom can appear on Hill Street Blues. Regarding James Bond, I think your point falls flat, probably because you haven’t seen enough James Bond movies. James Bond is an identity. The outfits, the cars, the voice, the mannerisms, etc are all part of that identity. In fact, the identity is so defined that new actors took the role and he was still identifiable within moments. Heck, the screenplay of “On Her Majesty’s Secret Service” even calls this out when George Lazenby appears on camera for the first time. 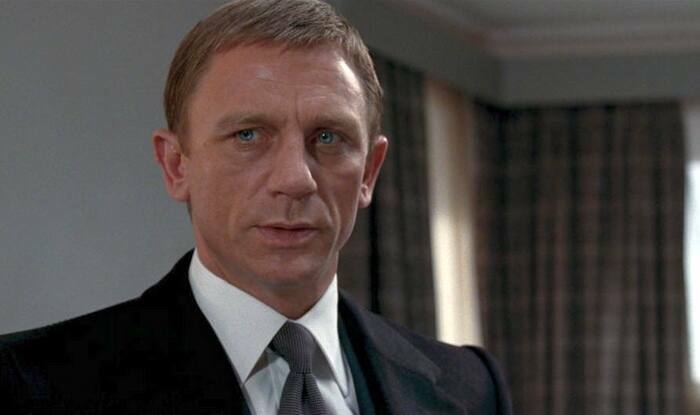 James Bond / 007 is just as much of an identity as Spider-Man is. In many ways, more so. We can see the thought bubbles in the comic book (or here the thought voice over in cartoons / movies). The character of Peter Parker, in terms of personality, isn’t really any different than the character of Spider-Man. However, whoever the man is behind the James Bond persona, is a very different man than James Bond. We only see glimpses of that man throughout six incarnations of actors and 24 movies, but the glimpses we see shows a man that clearly has a very different identity. The movies are remarkably well written because they almost always show Bond only during moments when he is “on the job,” subtly skipping downtime when he would revert to his other self. Thus, I argue that James Bond clearly fulfills the identity portion of the requirement. At that point, he can only fail on powers or mission. I don’t think the latter is even vaguely up for discussion, and I will happily argue (with citations from 24 different movies) that he more than clears the bar for the powers requirement. I just remembered. He also has a clearly identifiable signature weapon, the P-series Walther. That is as much a signature as a big red S.
So the thing here is that I see where both of you are going. While Coogan is correct in that I can’t DEFINITIVELY say that that picture is from a James Bond movie and not some other Daniel Craig flick, Strauss is also right in that… honestly… I can… even if I didn’t know from the link that it was Quantum of Solace, I at this point default to seeing that guy in a suit or tux as James Bond. It’s the problem with typecasting. 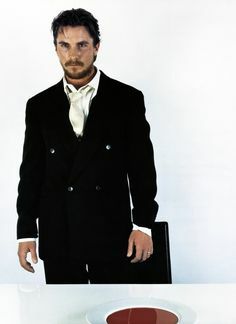 I will never randomly assume that an image of Daniel Craig is Jake Lonergan, even if he has a cowboy hat on, unless i KNOW that the pic is from Cowboy & Aliens. But I do recognize him as iconically Bond. And if I go to con somewhere and I see a guy walking around in a tuxedo with with anything even remotely resembling a Walther pistol, I’m going to assume he’s cosplaying Bond in the same way that I assume anyone with a Fez and a bowtie is being the Doctor. Or anyone with a with a trench coat and a Tom Baker scarf… hell, that’s so iconic that we even call it the Tom Baker scarf and anyone with any understanding of the Doctor Who fandom knows exactly what I mean. 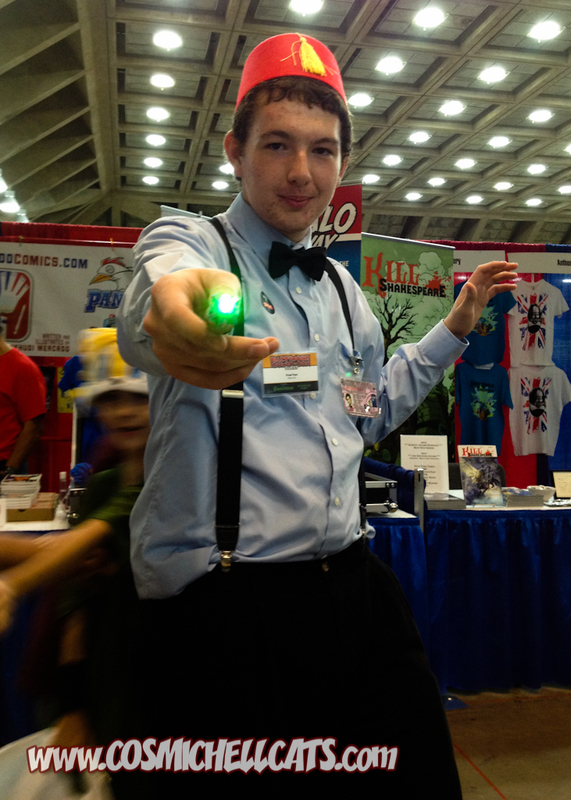 For instance, here’s a random Doctor cosplay from a con. The guy looks nothing like Matt Smith. For all intents and purposes he’s just a guy with a fez. To me Smith’s doctor really NEEDS the tweed jacket. And yet, I had no question of who he was when I saw him even before I asked to take his picture and he took out the sonic screwdriver. yes, part of that is context and familiarity with the character and being in the context of a con. But I submit that if I saw that guy walking down the street outside of a con, I would assume that he is a Doctor Who fan because the subject iconography is recognizable enough to me. 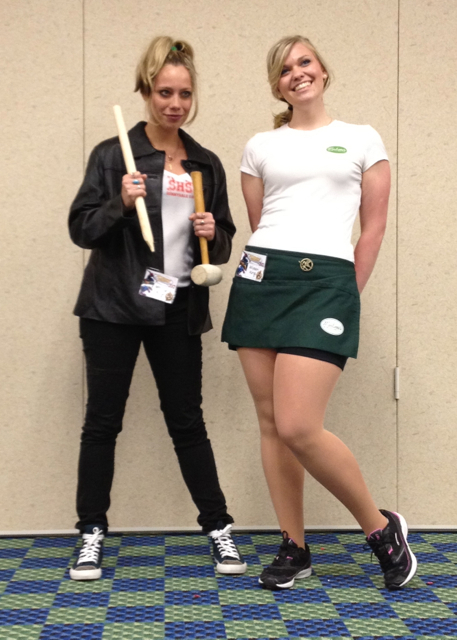 they were clearly cosplaying as Buffy Summers and Sookie Stackhouse and I thought it was hilarious. Neither really looks like the classic actress. Really, the whole Buffy costume is the stake and the ponytail, neither of which she always has. And the Sookie Costume is just the Merlotte’s T-shirt and the apron, so really it could be any character who worked there on True Blood. But I knew it wasn’t. Even though the two characters are completely unrelated, and minimal work was put into the outfits, in context I immediately recognized what they were going for. 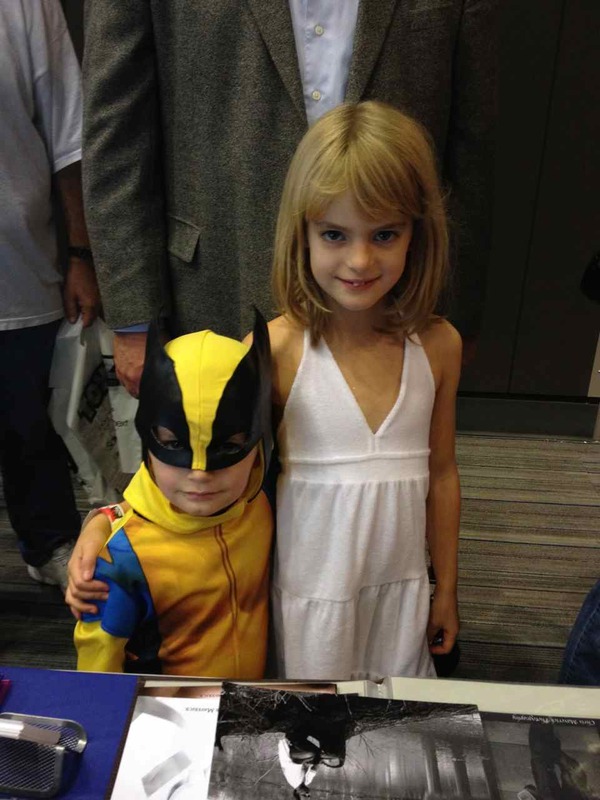 as Emma Frost, even though I’m sure we’d all get it immediately, even if she wasn’t standing next to her brother Wolverine. In fact, I’m betting, Stephanie wouldn’t even have recognized the girl as being in costume, even if she’d seen her at a comic book convention. Similar if she saw a woman playing Jessica Jones, or probably even a man playing Luke Cage. It just wouldn’t occur to her to think of them as “costumes” at all… just clothes. So where I think it gets really weird but easy to recognize as an issue is in things like this classic meme that floated around a while back. 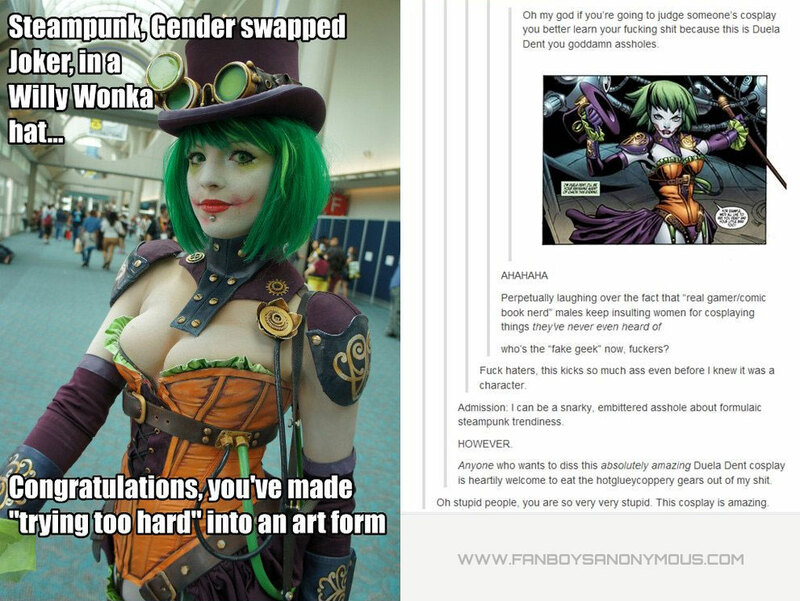 The original memester assumes that the cosplayer is “trying too hard” because he fails recognition of the iconography despite the fact that it is one of the most technically proficient cosplay re-creations that I have ever seen. And then of course there’s things like the Jane-ites. While I certainly don’t have the contextual knowledge to know who any of those people are dressing up as, they certainly know… and I am certain I have 19th century BritLit colleagues who could go through that image and tell you without fail who each cosplayer was portraying (because I’ve seen them do so with similar images in academic talks). So my point here is that I think Peter’s concept has merit. But I think it’s highly context dependent in any particular fandom which lends greater subjectivity to the question of “what is a superhero” which was sort of my point. I assume there is a point to these questions. Because I honestly am not sure what point you are trying to make. I see where he’s going. The point is that Identity is visibly recognizable and indisputable… You can’t tell if the Bale picture is Christian Bale, Bruce Wayne, or John Conner… But Batman is Batman whether he is being portrayed by Bale, West, Keaton or some random dude at a comic convention. That kinda feels like a cop out to me based on medium. It works because Daniel Craig is an actor. You could easily make the same argument for Danny Rand / Iron Fist or Luke Cage / Power Man, but they are labeled as superheroes, even when in civvies. Is Bruce Wayne Batman when he’s not in the suit…. Take the beginning of *shudder* BvS, is the dude Ben Affleck is playing that runs into the falling building Batman or does Batman need the suit. I’d say either answer is acceptable. It’s vaguely off-topic, but Watchmen is strange because the book is intentionally a deconstruction of the superhero genre (and an excellent one at that). Before you go too far on this response, I should let you know I have never seen the Netflix series. I am referring to comic books primarily here (a little cartoon stuff, too). Michael Strauss Sure. I cover Luke Cage in detail in the definition chapter in my book. I’ll Message you a copy of the pdf. Mission, powers, identity (codename and costume), generic distinction (origin, etc.). Yes, you’ve said that quite a few times in the post. I can’t tell what point you are trying to prove or disprove with these Socratic questions about pictures. Sorry. I’ve been having this conversation for 25 years, so I’ve been through each of these points repeatedly and my frustration tends to express itself in declarative statements. With these pictures I’m trying to point to the iconicity of the superhero genre. The costume matters to the genre. It’s the clearest marker of the genre. Costume/clothes don’t matter to the spy genre. Chris Maverick yeah. It’s hard to jump on all these questions since they are all the same question. Part of it for me is that I feel that I settled the definition question back in 2002 when I finished my diss and then again in 2006 when I published my book, so it always seems weird when the question gets brought up. But that’s on me. By the way, to everyone in this discussion, because I did my dissertation on the superhero genre and defined it, I get a dose of dissertation dementia when I talk about the definition. If we were at a party, I would back you into a corner and yammer at you for an hour (I’ve done it). Never ask someone who is dissertating about their topic. It’s actually a topic I try to avoid because of my dementia. I was going to work on my musical about Santa with my daughter, but now I’ve just spent an hour on the definition of the superhero. Oy! I mean I have spent the past week and change with someone who is showing us the area of the world she wrote her dissertation in. We had to read part of her dissertation for context because literally no one else ever has done any work on what she has (possibly there’s something locked in Soviet archives, but unlikely). She has not once gotten “dissertation dementia”. She has taken intense questioning gracefully. She has insulted no one, explained where there are gaps or possible flaws in her work, and shown where there is room for disagreement. I didn’t think I had insulted anyone. I was definitely short with several people in the discussion because I was actually trying to hold back because it’s in my book (so I sent my book to two people). And that’s great that your friend was able to work through all that. The conversation is different in person, and I’m exaggerating in my post. And if I did insult someone, I appreciate knowing where I came off as insulting so that I can analyze it and not do it again. Humor is often hard to achieve and it’s easy to go wrong on social media. Do you not think that repeating that the information is all in your book and that this is a settled question is insulting to people who have produced other theories about superhero definitions? Do you not think it is insulting and dismissive of other people who are having a conversation about how they understand superhero conventions? The people you are speaking to deserve to be treated at the very least with forbearance, whether they are interested laypersons like Mike Strauss or academics like Chris Maverick. That feels more than a little like trying to shut down conversation. As a result, I (as a common layperson who isn’t super (heh) into superheros) find myself not wanting to make any further comments here AND I have less of a desire to read that book. Many earlier definitions include dual identity as a defining feature, which suggests that the character type can and has evolved. In 1938, Jerry Siegel and Joe Shuster’s Superman wears an iconic costume and closely guards his identity. In 1962, Stan Lee and Jack Kirby’s Fantastic Four have codenames but no dual identities (and, briefly, no costumes). In 2001, Brian Michael Bendis and Michael Gaydos’ Jessica Jones has no codename, no costume, no dual identity, and, since she works as a professional private detective, no selfless mission. She is only superpowered—the opposite of Batman, who in all of his incarnations possesses all of the traditional qualities but superpowers. Since Jessica Jones and Batman are both understood to be superheroes, the character type appears to have no requisite qualites. 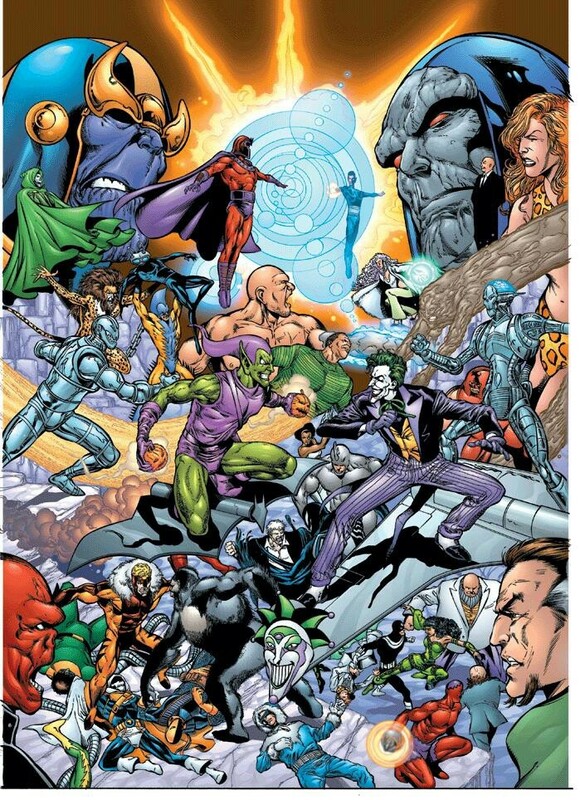 Instead, individual characters may be defined by a range of possible traits, including association with other superheroes in a superhero comic. In terms of character traits, the hero type predates comics by decades and even centuries (Gavaler 2015), but if genre is defined as a tradition of direct influence, all post-1938 superheroes evolved from Siegel and Shuster’s first thirteen-page Superman episode in Action Comics #1. Simon J. Evnine clarifies the difference. The first approach considers genres as “regions of conceptual space,” and to be in a region a work only has to have “certain features,” regardless of where or when the work was created (2015: 2, 8). The second approach considers genres as “historical particulars,” and to belong to that sort of genre a work has to be “read and interpreted in the light of previous works” and so understood in terms of “lineage” and “influence” (4, 16, 20). According to the first definition, sauropods and giraffes would both belong to the genre of long-necked animals, but, because their necks are the result of convergent evolution and not ancestry, sauropods and giraffes do not belong in the same genre according to the second tradition-based definition. Both approaches are useful—though the second is largely contained by the first, which emphasizes inclusiveness and so expansiveness. By looking at the superhero genre as a shifting set of formal features, it is difficult to exclude a range of pre-comics characters, including the Shadow, Zorro, the Scarlet Pimpernel, Spring-Heeled Jack, and the Count of Monte Cristo. This would seem to imply that superheroes exist in a similar conceptual space to folk heroes (John Henry, for example) and epic heroes, at least in the first definition. The space is not identical, but now I’m thinking of an article I read about the Mad Max series, arguing that Max is not, exactly, a modern movie character, but rather a modern version of a mythologic or epic hero. You know it is a Mad Max story because he doesn’t tell his name, because of the lizard, etc. (Looking for this article, I found a few others along similar lines, but not the one I am thinking of, sadly.) Max is clearly not a superhero, but he shows how modern characters can inhabit ancient spaces and forms of storytelling. That, to me, implies that yes — older characters can also be understood as functioning within modern genre, viewed through the correct lens. I think i’m right there… with the two of you. The problem with hardline genre definitions is that they’re conceptual and necessarily subjective. Few would argue that, I dunno… When Harry Met Sally isn’t a romantic comedy. But when you get to the Big Sick (which I clearly positioned as a romcom in my review) things get hazier. Sam Spade is clearly a hard boiled detective. But is Batman? Same thing with superheroes. There’s some examples that are so iconic they’re almost indisputable but the entire point of literary studies is that subjectivity comes into play when you’re not discussing the prime cases. Peter’s definition is clearly far more narrow than mine. Chris’s is far more broad. Having the definitions starts a discussion but given an infinite number of readers for an infinite number of texts, clearly subjectivity has to come into play. What about myth/legend/religious characters such as Achilles and Siegfried? Are they just ‘heroes’ despite their superpowers? If Wonder Woman is a superhero, is Hercules(of myth, not any theoretical marvel/DC version) equally a superhero? For some reason I presume the definition of superhero requires the character to have a modern author, but I’m not at all clear on why I presume that. I’d argue that you presume that because the term superhero has become intimately tied together with the medium where it was coined (comic books). Comic books are a modern form of media, thus because of that entangling, all superheroes must be modern. I think the entangling is wrong, but that flies in the face of general consensus. arguably they inform it… but its also arguable that they’re identical. Another book I love “Our Gods Wear Spandex” by Christopher Knowles argues that the superhero isn’t really its own thing at all and is really just a repackaging of classic myth. Matt Wagner’s MAGE series basically is basically structured around this very idea.